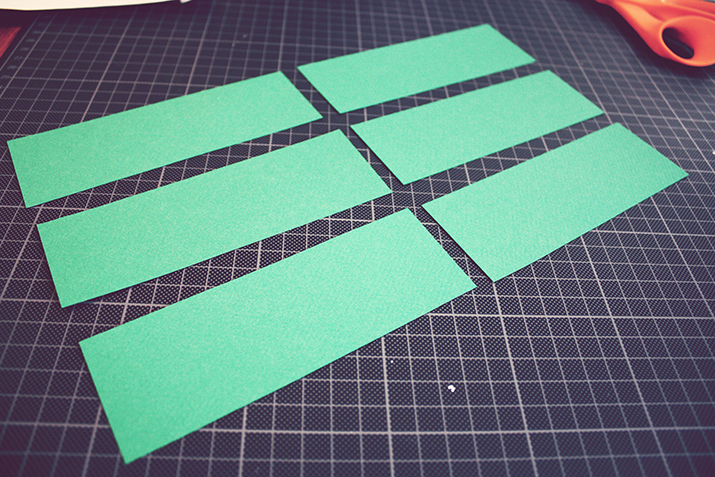 8.5″ x 11” sheets of green paper, at least 2 dark/medium green and 1 in a complementary lighter green. I like to have extras in case of mistakes. So, this is not that hard to do without any graphics program on hand. We’re going to use 2 pieces of green paper, some tape, and a paint marker to create a 6’ long “stem” of the growth chart, and then make some leaves. 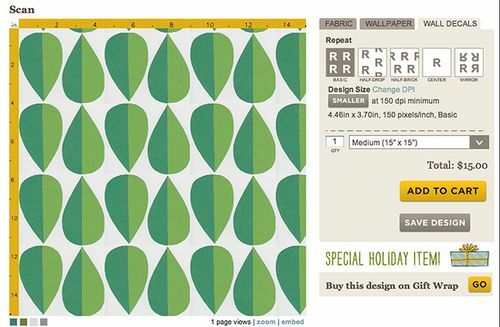 I should point out before you get started that using this method will result in 3 separate Spoonflower files. If that’s not economically feasible for you, find a friend with Photoshop or Illustrator and skip to Method 2. Start with a sheet of 8.5″ x 11” green paper. Take a ruler and pencil, and measure 6 inches down each short side and mark. Draw a pencil line connecting these marks across the paper longways. Measure and mark the paper along the long edge at 2” intervals (creating 5 rectangles 2″ x 6”). 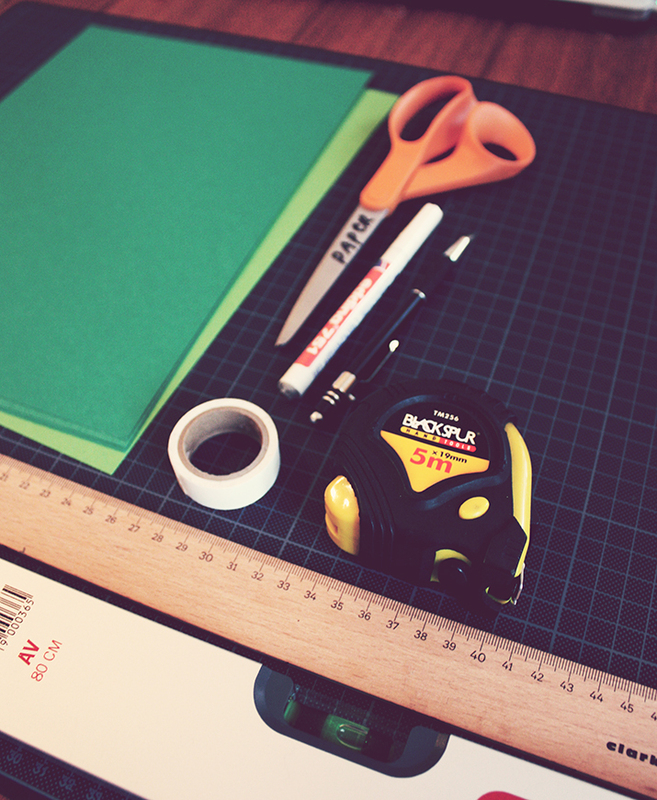 Measure 6” along the extra 2.5” bit of paper left to create a sixth 2″ x 6” rectangle. 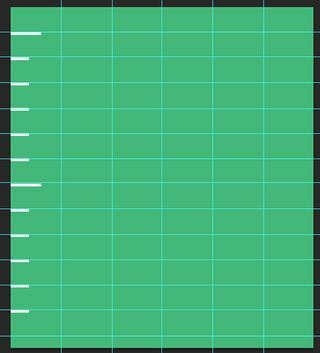 Mark inches along the sides of the rectangle. 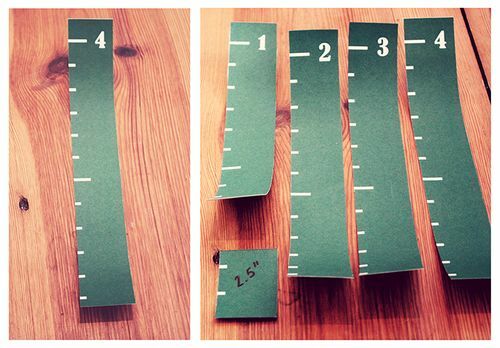 Apply tape to create a stencil for the lines along your growth chart as shown in the photo. 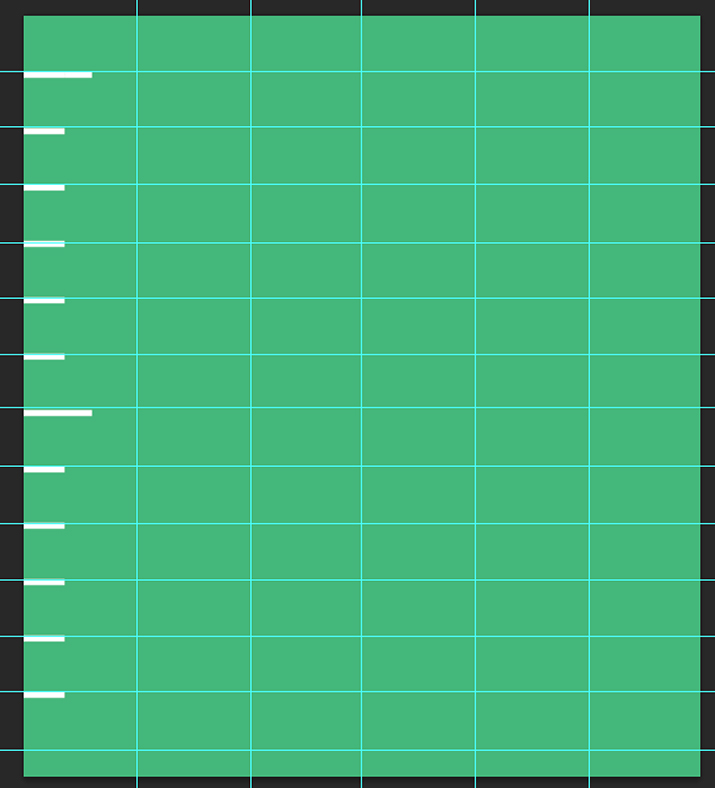 I made my lines about ⅛” thick and ¾” long. Take the white paint marker and color in the spaces you’ve left in the tape stencil. You may have to give them a couple of coats of paint. Note: you can also line up all the rectangles and tape all together to save a little time and tape. 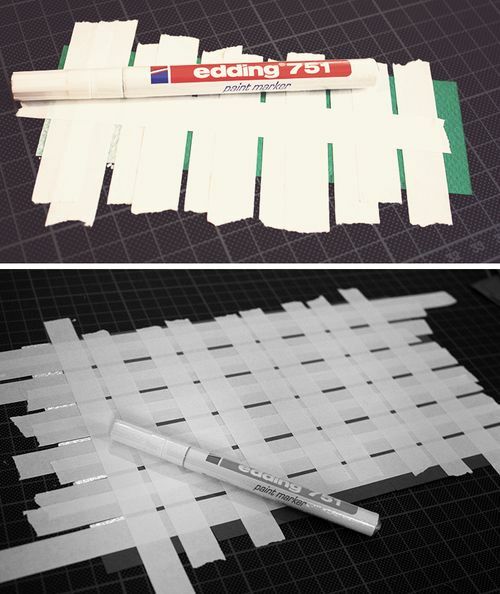 Remove the tape; nice sharp white lines! You now have 3 feet of stem, divided into 6 pieces. Take three of your rectangles and freehand the numbers 1, 2, and 3 beneath the top lines. If you have number stencils on hand, tape those down and use them instead . I just practiced writing numbers for a few minutes until my handwriting looked nice and then just went for it. 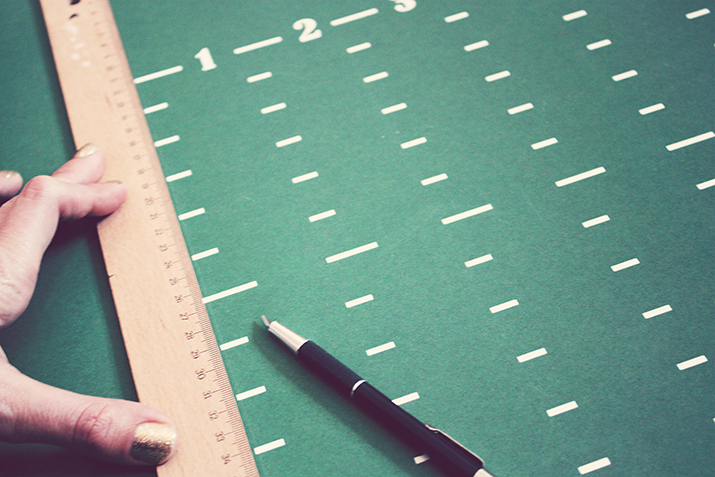 Handwritten numbers will give your growth chart a personal touch! Don’t stress over your handwriting. In a world of digital everything, handwriting is wonderful and looks wonderful, even yours. To prepare for scanning, arrange the finished rectangles on top of an extra piece of green paper and tack down with a little glue. The reason I do this is because once the file is scanned and eventually printed onto wall decal paper, I’ll have a little extra at the edges of each portion of the stem in case I want to overlap them when assembling on the wall. You should still be able to see the edges for exact measuring and cutting. 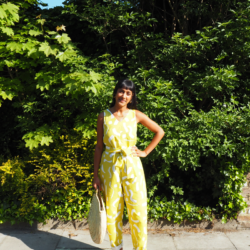 Now…repeat all these steps to make feet 4, 5 and 6! Scan both completed 8.5×11” pieces at exact size or 100%, and at Spoonflower’s default resolution of 150dpi. Check your scanner’s manual if you’re not sure how to scan at exact size—it’s important that your careful measurements stay intact! Now, let’s make the leaves. Freehand draw a leaf on some of the paper and cut out with scissors—I made mine an Orla Kiely-esque teardrop shape. 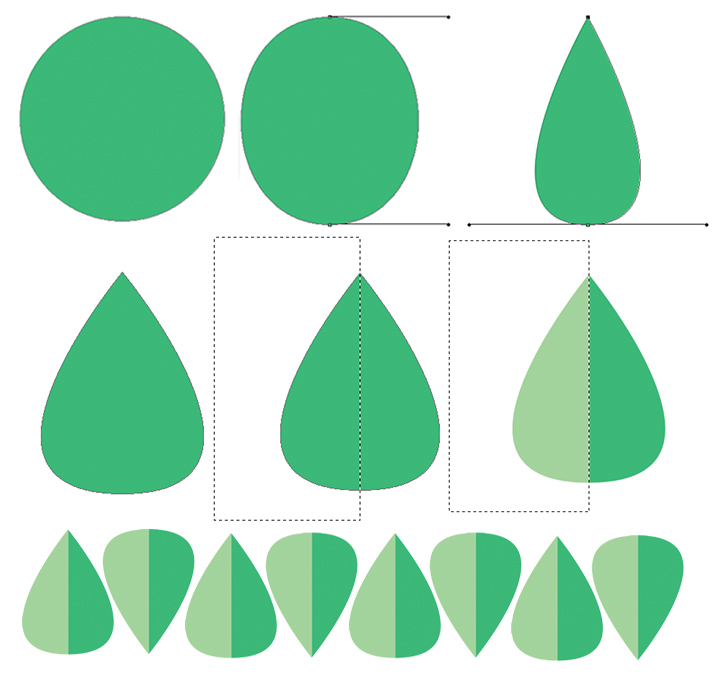 Trace the same shape onto the lighter paper and cut out. Now chop both leaves down the middle and tape together so you have two two-toned leaves that are mirror images of each other. That bit’s important so you’ll have leaves on both sides of the stem that mirror each other (ie light color on top every time). Place the leaves on the scanner bed like I’ve done in the picture above and scan at exact size, 150dpi. 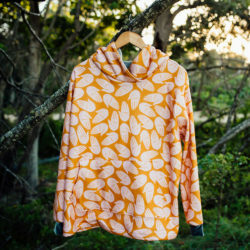 Bonus: Once you upload this file to Spoonflower you’ll get an awesome leaf pattern that will also look pretty amazing as fabric or wallpaper. Your favorite graphics program. 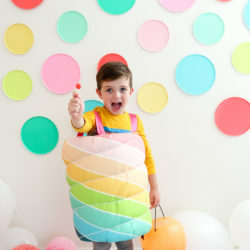 You’ll need to be able to create guides, apply type to an image, use a paint bucket to fill in areas with color, draw and modify shapes, and copy and paste. I used Photoshop. Illustrator would probably work even better. 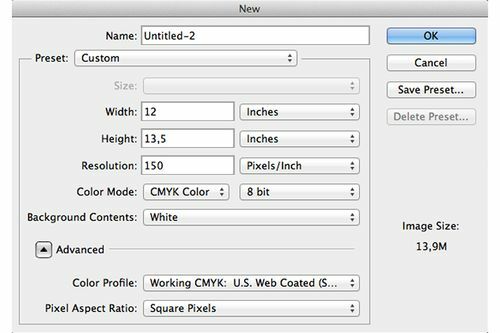 Create a file that is 13.5×12” at Spoonflower’s default of 150dpi. Use the Paint Bucket tool to fill entirely with a pretty medium-to-deep green. 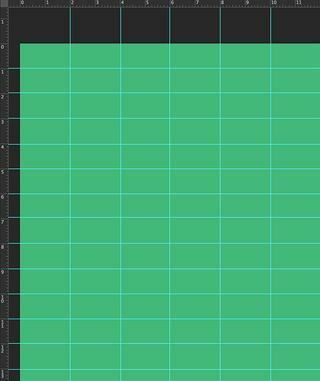 Create guides at 1” intervals running top to bottom, and guides at 2” intervals across the image. These will become 6 foot-long columns of the “stem” of your growth chart. Following the guides you’ve drawn, create ¾” lines to designate inches along the left edge of your image (I actually cheated and used em dashes in the typeface I was going to use for the numbers. Do what you feel.) 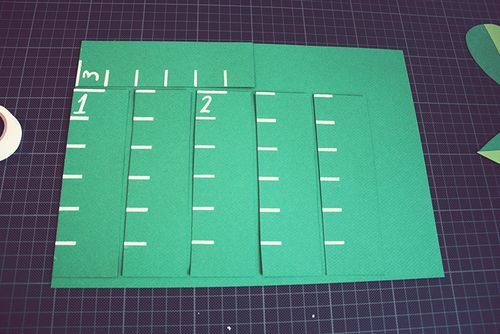 If you want, make the markers for 6 and 12-inch intervals a bit longer. 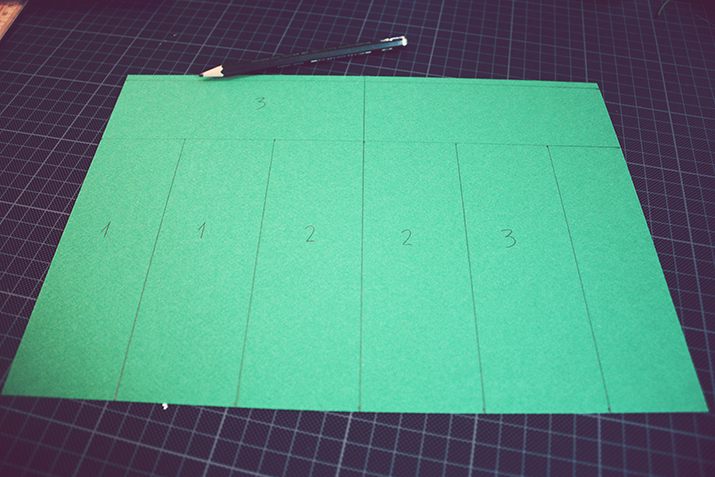 Copy the marks you’ve made 5 times across your image, lining them up with the 2” guides. I removed my guides at this point and added a new one to line up my numbers against. Place number 1-6 along the top near each 12-inch marker. 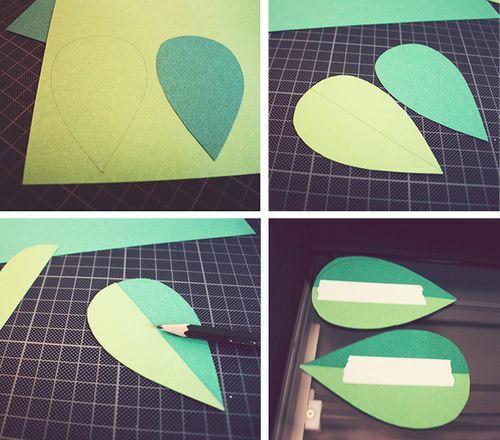 Make a leaf shape by first creating a 3.5” circle with the Ellipse tool. (Make sure it’s filled with the same green as your stem.) Next, if you’re using Photoshop, use the Delete Anchor Point tool (in the Pen tools) to remove both anchors on the side of your circle, creating an oval. Select the Convert Point Tool (also in Pen tools) and click the top anchor point. Your oval should transform into a teardrop. I used Transform>Scale at this point to widen it into the shape I wanted. Now rasterize it, select half the teardrop shape with the Rectangular Marquee tool, and use the Paint Bucket to fill with a lighter, complementary green. Copy and make a duplicate of your leaf, then go to Transform>Flip Image Horizontal to make the second leaf a mirror image of the first. Rotate it 180º and arrange next to the first leaf and crop. Check that the leaves are 150 dpi and around 3.5” tall, then save and upload to Spoonflower. 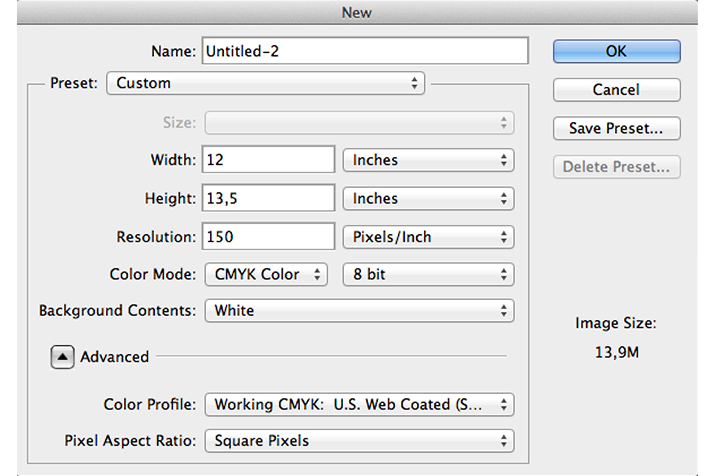 **Optional: Create a new 30×30” 150dpi file. Copy the “stem” file and paste once in the upper left corner and then a second time immediately below it. Then copy and paste the leaf file as many times as you need to, to fill up the rest of the square. 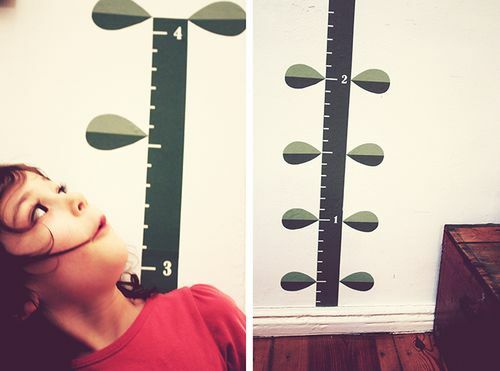 This allows you to get everything in only one wall decal file and make two growth charts—one for you and one for a friend! Wait by the mailbox eagerly for several days. 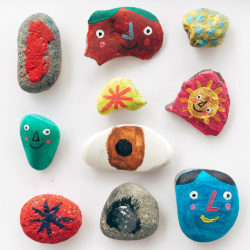 You can use some of this time to make sure the wall you want to decal is clean and free of debris. 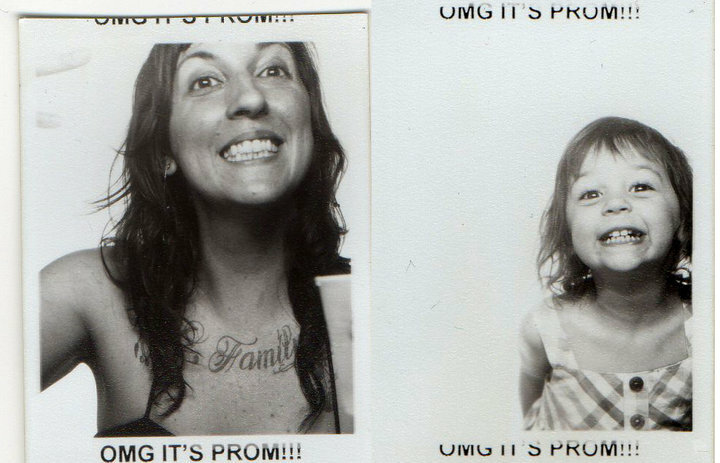 (Please ignore the fact that my walls are embarrassingly filthy in some of these photos.) 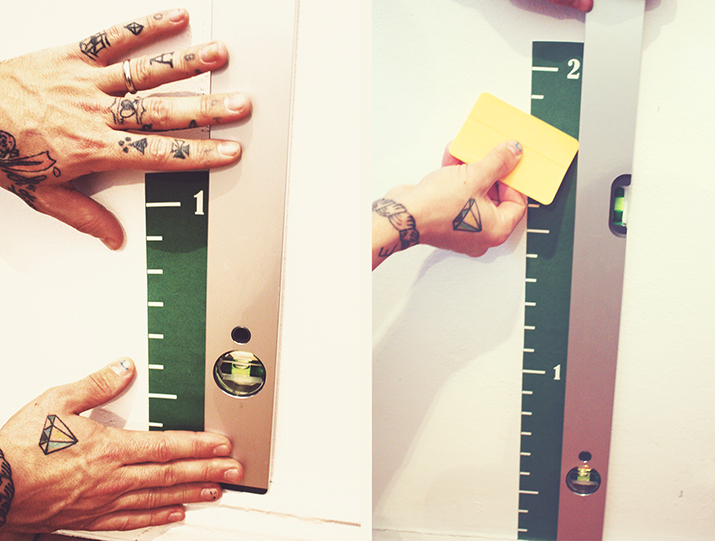 You can also prepare by measuring and noting any moulding at the floor where your decal will “sprout”. Unroll your decal(s)—you might flatten them under some heavy books overnight to make them easier to handle. I skipped this step too and found myself wrangling a lot of curling, unwieldy decals. 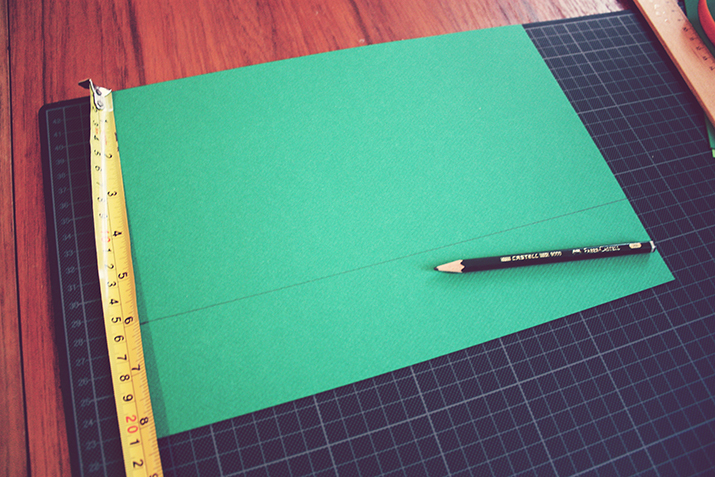 Using the lines as a guide, line up your ruler and with a craft knife carefully cut your stem apart into strips. I’m awful with an exacto knife, and so the cutting part of this project put me in sort of cold sweat…if you can use a paper cutter for this, do. If you’ve made your decal using Method 2 (with software), add 1” to the top line of each strip and cut. 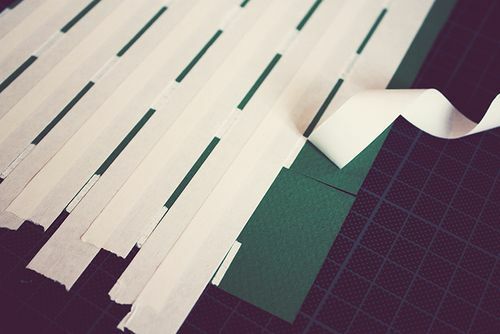 Add ¼-½” below the bottom line of each strip and cut. You now have 6 strips that look something like the photo below. Last step to finish cutting the stems: remember when you measured your moulding? Cut that much off your bottommost piece. My moulding was 2.5” so I’ve removed that bit from the first-foot rectangle. 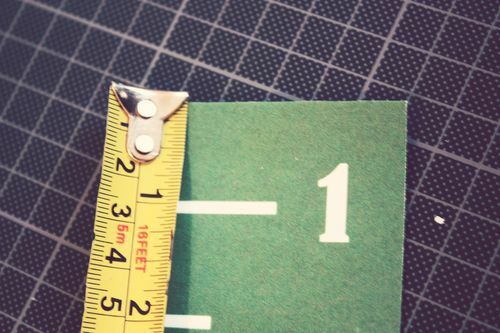 If you’ve made your growth chart decal using Method 1, you should be able to see the edges of the rectangular strips you originally cut out and painted—follow these lines (with the ruler!) to cut out each piece, adding an extra ⅛-¼” at the bottom of each portion for the pieces to overlap. Again, if your wall has moulding at the bottom then measure and cut that amount off the first portion of your stem. 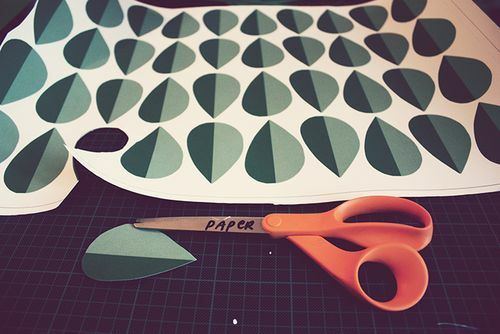 Grab your trusty still-sharp-but-designated-for-crafty-tasks scissors and cut out a bunch of the leaves, at least 12-16. If the only scissors you have on hand are your nice fabric scissors, please don’t ruin them. Use a craft knife for this step instead. Time to apply to the wall! Peel off the backing to your first strip of stem. Make sure the bottom of the decal is flush against the top of your moulding at the floor. Using a level as a guide to keep things straight (having a friend hold the level is helpful) carefully apply to wall and smooth using the little plastic squeegee that comes with your decals, leaving about ½” at the top unstuck. 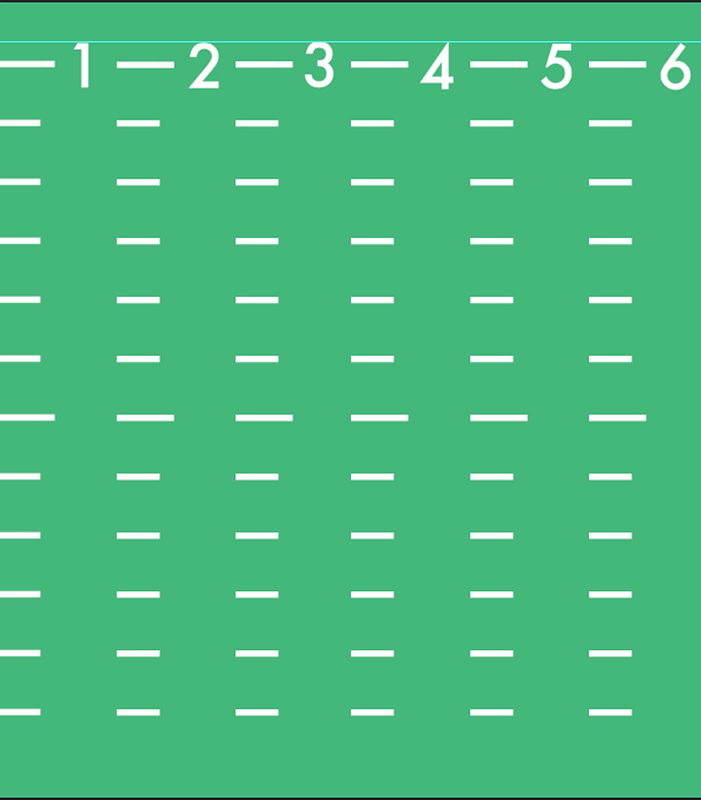 Take the next strip and, starting from its bottom / top of prior strip, line up so any extra that you’ve left at the bottom tucks under the piece before it, and make sure there is exactly 1” between white lines. Smooth against wall and keep using the level to make sure your sprout doesn’t veer off course. Stick the leaves in pairs at the very bottom and top of the stem. 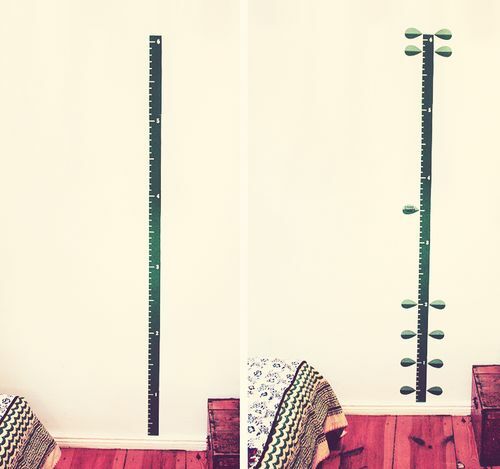 You can place them all over and just have a cute sprout to measure your kids against, or you can leave the middle part empty of leaves and add them to mark height milestones. All done!